Kirwan and De Clifford histories. Built around 1801 as the new home of the Kirwan family formerly of Claremount, Claremorris. It was bought by the Duke of Bedford in 1853 for Lady de Clifford, the wife of his first cousin. In the 1860s Henry Edward Joly and Charles Joly are recorded at Dalgan Park (”Connaught Telegraph” 27 March 1867). In 1894 Slater noted it as the seat of Allan J. Algie.The house became a seminary for the missionary Society of St Columban in 1918. The Irish Tourist Association file describes the fine mansion as in ruins. It contained about 50 rooms and had been stripped of its roof and fittings about a year previously, circa 1944. It is now demolished. This junior branch of the Kirwans of Cregg Castle, county Galway, were merchants in the city of Galway, who received grants of lands, over 3,000 acres, in the parishes of Kilcolman and Mayo Abbey, barony of Clanmorris, county Mayo, under the Acts of Settlement. They bought the Dalgan estate from the Earl of Clanricarde in 1771 and so acquired lands in the parishes of Kilmainemore, Moorgagagh and Shrule, barony of Kilmaine, and in the parish of Toomore, barony of Gallen. 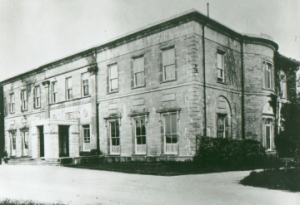 At the beginning of the 19th century they moved their main family residence from Claremount on the outskirts of Claremorris to Dalgan near the village of Shrule. In 1853 the entire estate of Patrick Kirwan was sold in the Encumbered Estates’ Court for £48,300. The purchaser was the Duke of Bedford on behalf or in trust for Lady de Clifford. The Kirwan family moved to Gelston Castle in Scotland. Belonging to a branch of the Galway tribe which had settled in Cregg Castle, Baunmore, they were related to the Kirwan of Castlehackett, they acquired the land of Dalgan in the middle of the seventeenth century. It is most likely that Edmund Arigid Kirwan was the first to settle there, his son Alexander succeeded him and is said to have lived there at the end of that century. Edmund, Alexander’s son, donated a gold chalice to the church of Shrule, bearing the inscription “Orate pro animabus Edmundi Kirwan et uxoris ejus Margarita Kirwan qui me fieri curavit A.D. 1722”. This chalice was made by Joyce a jeweller in Eyre st. Galway. Patrick Kirwan, in 1830, donated the present parish church of Shrule when Teampail Cholman was burn down. He had two sons and four daughters. Charles Lionel was his heir, Charles was made High Sheriff in 1846. He married Matilda Elizabeth of castle Douglas, Scotland, where the family moved when they left Dalgan in 1853, having to sell their estates through the Encumbered Estate court. They seem to have been good landlords, but one has to remember that bonfires were lit in Shrule to greet the news of their losing their estate, so they might not have been as popular as generally believed. 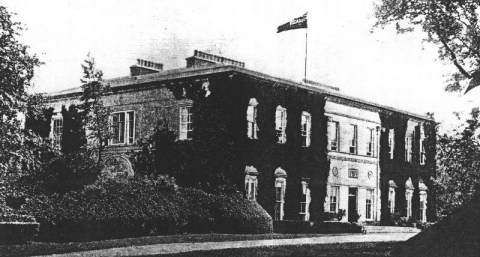 It is said that the large house in Joyce park, south of the river and outside the limit of the parish, was build by a Kirwan for his mistress when she became pregnant, a common practice in the country at the time, when contract marriage among landlord were only for the purpose of strengthening a fortune and assuring an heir. The son that resulted from that relationship later left for Australia. In 1853 the Dalgan estate was bought by the Duke of Bedford for Lady de Clifford, who was the wife of his first cousin. The estate was comprised of lands in the baronies of Kilmaine, Clanmorris and Gallen, county Mayo and in the barony of Clare, county Galway. Her estate was mainly located in the county Mayo parishes of Mayo, barony of Clanmorris, Kilmainemore, barony of Kilmaine and in the parish of Donaghpatrick, barony of Clare, county Galway. In 1876 Lord de Clifford owned 11,594 acres in county Mayo and 1406 in county Galway. Most of the county Mayo estate was vested in the Congested Districts’ Board in February 1914 and an offer had been accepted for the county Galway acreage by March 1916. William Russell came to Dalgan once and he was received by an enthusiastic crowd, with a speech from Fr. Phew P.P..
Shrule was illuminated by bonfires and houses opened to regale the crowd, the Russells being received in Dalgan by the sound of a firing cannon. John Russell, third son of William married Sophia Southwell-Clifford-Coussmaker in 1822, she was the granddaughter of lord de Clifford who died in 1801 and the title passed to her in 1833. Their only son Edward, born in 1824, inherited both the Dalgan estate from his father and the title from his mother, he died in 1877. His son, also named Edward, then inherited, he died in 1894 at the age of thirty nine. It was he who parcelled and sold large portions of the estate. The de Cliffords were mainly absentee landlords but they seemed to have been popular in the area. Jack Southwell Russell, 25th Baron de Clifford (2 July 1884 – 1 September 1909) was the only son of Edward Southwell Russell, 24th Baron de Clifford, and Hilda Balfour.He succeeded to the baronetcy on the death of his father on 6 April 1894 .He married the actress Evelyn Victoria Anne Chandler, known as Eva Carrington on 16 February 1906 at the St. Pancras Registry Office. He died on 1 September 1909 following a car accident at Small Dole, Bramber, Sussex, England, and was succeeded by his son Lieutenant Colonel Edward Southwell Russell, 26th Baron de Clifford, who was the last peer to be tried for a crime in the House of Lords. He inherited his title aged two when his father was killed in a road accident. Coincidentally, his trial before the Lords in 1935 was for vehicular manslaughter. 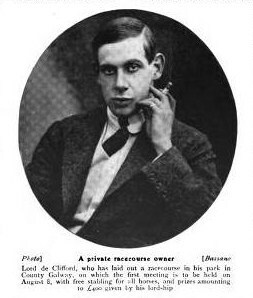 He was educated at Eton College following which he studied engineering at Imperial College, London and subsequently became known for his enthusiasm for fast cars, fast women and fast politics, or at least a youthful enthusiasm for the ideas of Oswald Moseley, being described as an “ardent British Fascist” by Time magazine. Although he was indeed a frequent competitor at Brooklands, raced at Le Mans and made an appearance at Monte Carlo in 1933 in a diesel type touring car, it is not for his racing career that the 26th Baron was to be remembered but rather for his various encounters with the legal system. Funnily in 1928 he made his maiden speech in the House of Lords, on the subject of road safety, in which he proposed introducing mandatory driving tests for anyone applying for a driving licence. During his career in the House he also argued for speed limits to be imposed. On 15 August 1935 Russell killed a man, Douglas George Hopkins, in a head-on collision while driving his sports car on the wrong side of the road. When a jury in the coroner’s court unanimously held Russell responsible, the police charged him with a felony. At first he was indicted and committed for trial at the Old Bailey, until it dawned on the courts that as he was a peer of the realm, only the House of Lords could try him for a felony. Since this had not occurred since 1901, when the 2nd Earl Russell was convicted of bigamy, the House set up a select committee to investigate the precedents and rules for such a proceeding. The trial commenced on 12 December, with the Lord Chancellor, Lord Hailsham, presiding, in the capacity of Lord High Steward appointed by the Crown for the occasion. The Attorney General prosecuted the case. Admission to the public was by ticket only. This was to be the last ever trial in the House of Lords, since the right of peers to be tried by their peers for felonies was abolished in 1948. (The House still has the power to try impeachments). Russell’s defence was that Hopkins’s vehicle had been travelling at excessive speed and that Russell had been compelled to switch lanes at the last moment to avoid a collision, only for the other vehicle to do the same. This defence was successful and he was acquitted. Is there a response to Howard’s comment? If so, I would be interested to hear. John Kirwan was my ancestor too. I’m trying to place my great grandmother, Mary Ann Davin, in Shrule parish. I believe her father was Michael Davin and her mother, Mary McGoff. I find her parents’ marriage (June 5, 1837) and baptisms of her siblings Honor, Winny and Patrick at St. Joseph’s Roman Catholic church in Shrule, but nothing on Mary Ann. Their residence was listed as Brackloon. Any ideas? Mary Ann emigrated to US in 1874. My Great-Grandfather, Daniel Gilmore, was a carpenter working at Dalgan for the De Clifford family. I understand he was in charge of maintenance for the house at Dalgan and also worked for the De Clifford family in Liverpool alongside his wife, Julia. To see all this information is most interesting. I believe Daniel worked for the family from 1870s (if not before) until his death in 1918. He lived with his family at a cottage in Deerpark, Kilmaine. I would be most appreciative for any information available about the Estate records for staff of the De Clifford family, including Daniel. Many thanks in advance for any assistance. I am a descendent of John Kirwan who arrived at Fremantle West Australia in 1850. His father was Edmund Kirwan of Ballyturin Co.Galway who inherited the estate from Edmund Kirwan of Dalgan. I am very interested in the comment in your web site about the house in Joyce Park that was built by a Kirwan for his mistress and whose son later went to australia. could that be our John Kirwan? any info on the “house in Joyce Park” would be appreciated.